A Madaraka Express train. Credit: Kenya Railways. The inter-county service on Kenya’s new Mombassa to Nairobi standard gauge railway was due to be running weeks after the opening of the inter-city service in May. Delays in the arrival of key staff from operator China Road and Bridge Corporation have pushed back the handover date meaning the service did not launch as expected on July 1. In a statement dated June 30, Kenya Railways said that it now expects the launch to be completed ‘in the coming weeks’ and confirmed on July 13 that it was not yet operational. 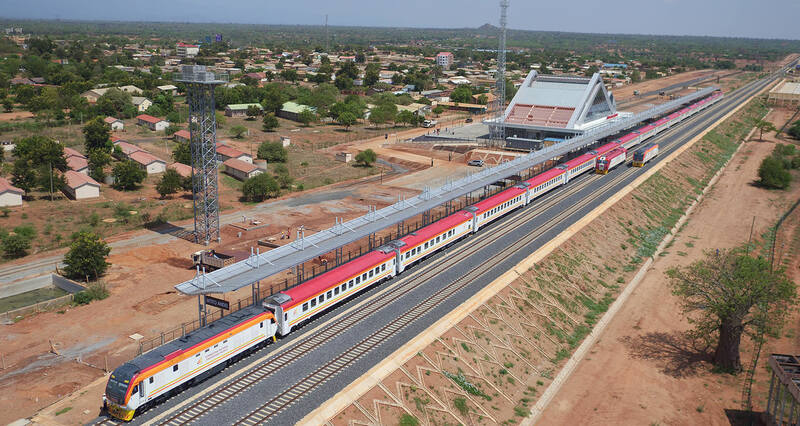 To date, around 75,000 people have travelled on the Madaraka Express inter-city service, which travels between Mombassa and Nairobi and opened on May 31. The inter-county service will make stops at the intermediate stations of Athi River, Emali, Kibwezi, Mtito Andei, Voi, Miaseny, and Mariakani once it is operational.